We arrived in Raleigh for a late lunch at Chuck's Burgers and Frites, one of many restaurants owned by local restauranteur, Ashley Christensen. Everything was delicious and was served in a very hip, urban environment. Burger joints are sometimes a little hard for us as Ava is not a burger fan but luckily she has recently acquired a taste for veggie burgers and she gave this one a big thumbs up. They also offer a grilled cheese if you have non-burger lovers along. The fries are served Belgian-style in a paper cone with your choice of 8 dipping sauces. The shakes looked yummy and they had a nice selection of local craft beers. Later we decided to grab some ice cream from a newly opened shop in downtown Durham. 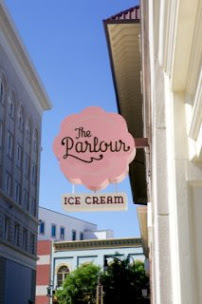 The Parlour began as a food truck and then opened a storefront after raising funds through a Kickstarter campaign. The ice cream is delicious and there are several vegan flavors available as well. The next morning we headed back to downtown Durham for breakfast at Scratch. This was one of the best meals of our trip! Southern biscuits and grits, great muffins, and delicious coffee made this a breakfast we all loved. The restaurant was right next to Parrish Street, also known as the Black Wall Street. There was a small museum showcasing the history of black entrepreneurship in the area and several street markers highlighting areas of interest. After breakfast we drove over to Chapel Hill and walked around the campus a bit (this was really not a college tour). We stopped at the Old Well, the symbol of the university that for many years was the only source of water for the two dormitories that flank it on either side. Now it is considered good luck for a student to drink from it on the first day of school. Also in the area is the Morehead Planetarium and Science Center, which offers multiple shows daily on weekends and the North Carolina Botanical Gardens, with the newly opened Children's Wonder Garden. We stopped for lunch at Foster's Market, located between Durham and Chapel Hill. Featuring lots of lunch selections such as salads and sandwiches, this is a great option that will please everyone. Don't miss the desserts on your way out! Next we headed over to the Museum of Life and Science in Durham. This is truly a great spot for kids and we easily spent 3 hours here and could have spent even more. Inside, there are all sorts of science-based exhibits on weather, space exploration, and engineering. But outside is where this place really shines. There is something to please everyone no matter what their interests: a farmyard, a butterfly house, a dinosaur trail and fossil dig and much, much more. We spent the bulk of our time outside and finished just as the museum was closing. The dinosaur trail and fossil dig is a must for all the dinosaur lovers out there. All of the plantings are from the time of dinosaurs and velociraptors, triceratops and T-Rex are all represented. The dig area has soil brought in from a fossil-rich area of North Carolina and finds can include shark teeth (we found several easily), shells, coral and small bones. There is also a great exhibit on the wind, how topography shapes the weather (with a fairy village feel) and brown bears, red wolves and lemurs! That night we were all in the mood for Mexican and so we decided to try Dos Perros. Lucky for us it was Sunday, which meant taco night. On Sundays and Mondays, the restaurant serves 6-7 different taco combinations in lieu of their regular dinner options and they were all amazing (between the 4 of us we sampled all of them). From the green tomatillo salsa to the delicious tacos, we ended the day on a great note!